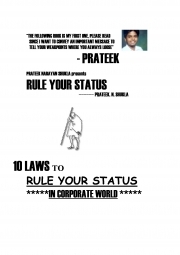 Description of "Rule Your Status (eBook)"
Long ago people use to work in offices that had their opening at 9am sharp and were closed maximum by 9pm. The people there had all rest and doodle-doo's as they had only to transfer files here and there after every 12hours or 24 hours deadline. But what now, the technology has advanced, Humans have turned machines. The boss needs reports every second. be it on anytime. even when he sleeps, he has his blackberry beeping with new official mails. and hence this increased the competition between workers, as this accelerated their aggresion. I have seen people, who work hard, harder than anybody, still are denied promotions and have to taste defeat from a person who had done nothing in comparision to him. but is this the way you will live. Corporate has many gates. The person who see's one, is the person who has never won. so people here I am. I am your Mentor. I'll give you the best ideas, the best funda's(ideas in hindi) to rule in corporates. I promise hereby to instill in you the leadership qualities. I hereby promise to instill in you the qualities of a perfect politician. Prateek Narayan Shukla :Is YOUR HARD WORK STILL UNMASKED IN CORPORATE WORLD?, BETTER GEAR UP, HERE ASK ME HOW TO AND YOU WILL FIND YOURSELF SWIMMING In OFFERS ! Reviews of "Rule Your Status (eBook)"